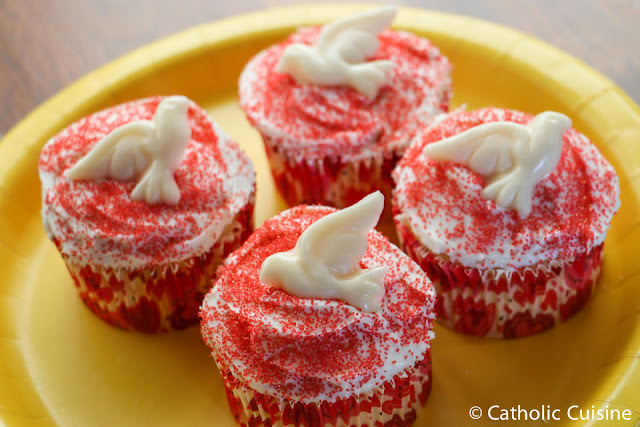 Decorate cupcakes with red sprinkles and white chocolate doves for a simple and symbolic Pentecost dessert! I packed along these cupcakes to share at our Homeschool Family Camp last year. 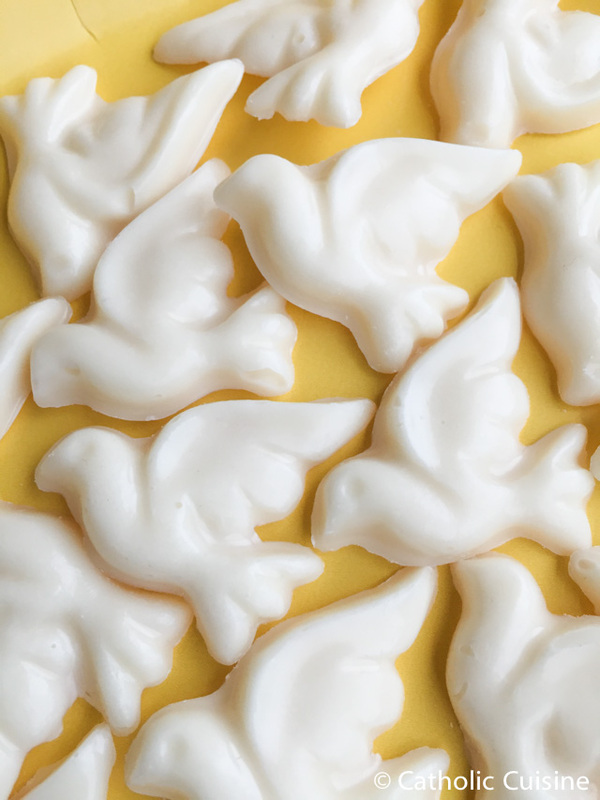 Candy molds are easy to use and can be purchased inexpensively online. 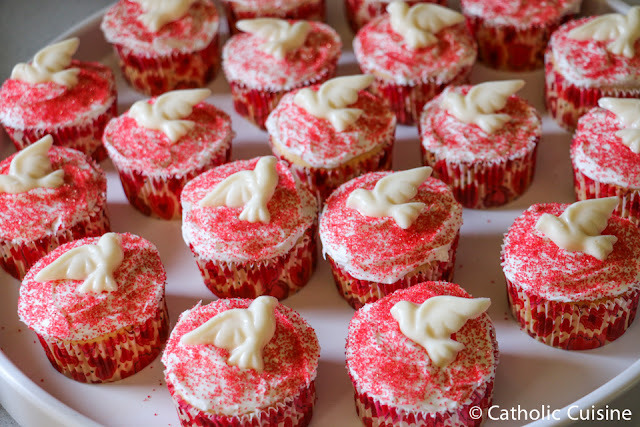 Other options include these Pentecost Cupcakes made with dove cupcake picks from the wedding section of the craft store and these beautiful Flaming Cupcakes for Pentecost! You can find additional recipes for Pentecost in the archives. Our family favorite has always been a Symbolic Birthday Cake for our beloved Church. I hope you all have a blessed Pentecost Sunday! One loving spirit sets another on fire. 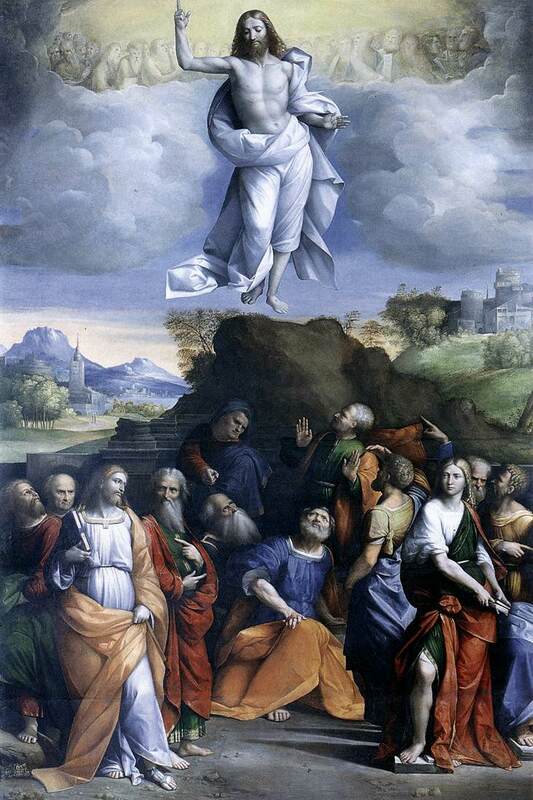 Our diocese is one that has moved the Solemnity of the Ascension to Sunday -- today, so today we celebrated Ascension Sunday and Mother's Day. My mother happens to love my deep dark chocolate cake frosted with whipped cream rather than buttercream frosting, and whipped cream just makes such heavenly looking clouds of yum, that I was reminded of the Ascension of Jesus. I created some edible Sacred Hearts of Jesus with strawberries, some melted chocolate chips in an icing bag (or ziploc bag) and some whipped cream tinted orange for some flames. It didn't turn out quite exactly what I had in mind, but the ratio of result to work was pretty high (ie very little work) and the taste was delicious, so I'll not complain. Believe me, if you've never decorated a cake, you can handle this one. You could technically hide any cake under the whipped cream, but my mom loves the contrast of the dark chocolate cake with the whipped cream, and it was Mother's Day, so dark chocolate it was. This cake is from scratch, but don't let that fool you -- it couldn't be easier. And frosting with whipped cream is so foolproof, you can have this cake finished in no time. Grease and flour two round 9” pans. In a large mixing bowl combine dry ingredients. (inserted toothpick will have moist crumbs, but nothing "wet"). In a large mixing bowl, begin whipping cream on medium. Add pudding mix and powdered sugar and turn up to high. (just don't go to far and make butter). After cake is completely cool, frost in between layers, sides and top of cake. two heart-shaped halves from each). Cut the leaves out by cutting out the hull and creating a heart shape at the cut end. Place 1/4 cup semi-sweet chocolate chips in an icing bag. Microwave for 30-60 seconds until melted. 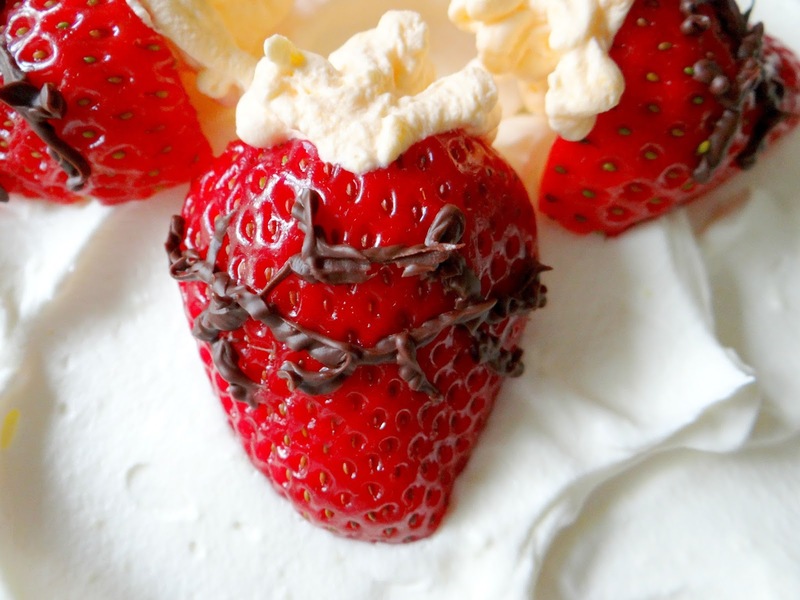 Cut tip off bag and pipe chocolate onto the strawberry in the shape of a crown of thorns (it might help to refer to an image of the Sacred Heart of Jesus). Let chocolate set and then place them in the center of the cake (if you have smaller strawberries than I did, you might need to use three -- for six halves). Tint a little bit of whipped cream yellow or orange and place in icing (or ziploc bag). Pipe flames coming from the tops of the "hearts". Refrigerate cake before serving and refrigerate leftovers.